Mix in sound effects to your party set with 5 sound effects included. Scratching, reverb and others. Plug in a guitar to amplify your sound. With automatic, RGB or individual colour settings you can light up the dance flow with strobes and a rainbow of colours. Pair your phone or tablet to your speaker to listen to your favourite tunes right off the device. Play tracks from two USB sticks at the same time. Mix seamlessly between songs. Listen to your favourite FM radio stations 600W Speakers Powerful 600W speakers fill any room with a massive sound. Included microphone to sing karaoke or amplify presentations/announcements. The full function remote allows you to control your speaker from a distance, skip songs, change the lights, change radio station and more. 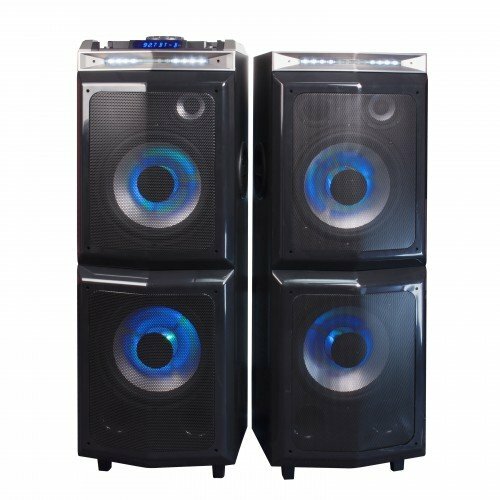 The Laser SPK-F600 Dual DJ Party Speaker System is tailor-made for parties with its X-Drive super bass delivering deep, punchy bass sound. Bring the music festival experience to your home with the massive twin speaker 600W system. Flashing lights create a club-style atmosphere that lifts the party experience in any event. With two channel inputs you can connect to your speakers with Bluetooth, 2 x USB In or Line-in and fade between songs for a continuous DJ set.